· After-school programs and a community activities center. Partners include Grand Rapids Public Schools, Habitat for Humanity of Kent County, Mercy Health Saint Mary’s, Dwelling Place, Grandville Avenue Arts & Humanities, Ferris State University, Hispanic Center of Western Michigan, and Roosevelt Park Neighborhood Association. Carmen Fernandez warmly remembers growing up in the Roosevelt Park neighborhood in Southwest Grand Rapids. Families of different races, ethnicities and languages got along, parents looked out for each other’s children and there were plenty of positive things for kids to do. Today, the principal of Southwest Community Campus sees a similar cohesive culture coming around Plaza Roosevelt, a major housing, school and health-care development planned along Grandville Avenue SW just around the corner from her school. 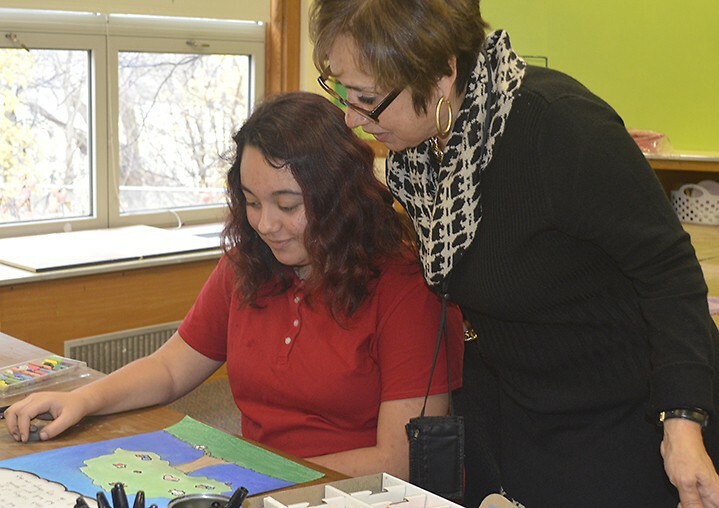 “Basically, it’s taking us back home to that community feel,” Fernandez said on a recent morning at SWCC, an English/Spanish dual-immersion school of about 870 pre-K through eighth-grade students. The 5.5-acre Plaza Roosevelt development will include a 500-student high school, affording neighborhood families a walkable option and Fernandez’s students the opportunity to continue their bilingual education. The school will be a key piece of the recently announced initiative anchored by Habitat for Humanity of Kent County. The comprehensive development will include affordable housing, Great Start Readiness preschool classes, increased health-care services, after-school programs and community recreation activities. Bolstered by $20 million in Grand Rapids Public Schools bond funding, the initiative will be the first of its kind locally and a model for communities elsewhere, officials say. By teaming with a half-dozen other organizations and neighborhood residents, GRPS will help serve the needs of young people from birth to adulthood, said Superintendent Teresa Weatherall Neal. “We’re all committed to the cause, and we know children are at the center of this project,” Neal said. The project emerged from a longtime neighborhood presence by Habitat for Humanity, which has built more than 60 homes in Roosevelt Park and has its offices there. The agency began purchasing properties in 2013 on the east side of Grandville Avenue SW, and owns the majority of the 5.5 acres planned for development, said Executive Director BriAnne McKee. Habitat will build affordable ownership homes in the tract, while Dwelling Place will develop rental housing. Still in preliminary planning, the project also envisions expanded services from Mercy Health Saint Mary’s Clinica Santa Maria and Grandville Avenue Arts & Humanities located at either end of the acreage. In surveying residents on what they wanted, McKee said, “We heard unequivocally having an opportunity to go to school in the neighborhood was of critical importance to them.” Older students now go to Union, Innovation Central and other high schools far from Grandville Avenue. GRPS officials heard the same desire from residents in gathering input for the district’s Transformation Plan, Neal said. But the district lacked the funds for a neighborhood high school until voters passed a $175 million bond last year, which included funds for an expansion of SWCC into a high school. When the district learned of Habitat’s development plans, leaders began discussing how they could work together for the school and neighbors’ needs. With GRPS bringing to the table $20 million available for school and community facilities, and enlisting other partners such as the Hispanic Center, “In some ways the school was a catalyst to finally pulling everything together,” said spokesman John Helmholdt. Community partners are meeting regularly to put flesh on the project, including the hiring of a site planner. There is no specific site for the high school yet and no firm timeline, though Neal said she has “every intention” of opening the school by fall 2018. Envisioned as part of a larger campus setting, the high school will feature two tracks, Neal said: a neighborhood school for nearby students and a dual-immersion school for students from anywhere. SWCC students, who come from as far as Rockford and Zeeland, will be able to continue their education there. For many SWCC families, having a high school their children can walk to will be of great value, said Fernandez, the principal. About 80 percent of her students are Latino, and about one-third come from Spanish-speaking homes. Many parents have told her they can’t wait for the new school. For the students, it will provide the opportunity to stay with bilingual classmates, many of whom they have been with for nine or 10 years, she said. It will also enable many to continue the increasingly popular dual-immersion program. Enrollment has risen from about 700 when she came 10 years ago to 871 today. 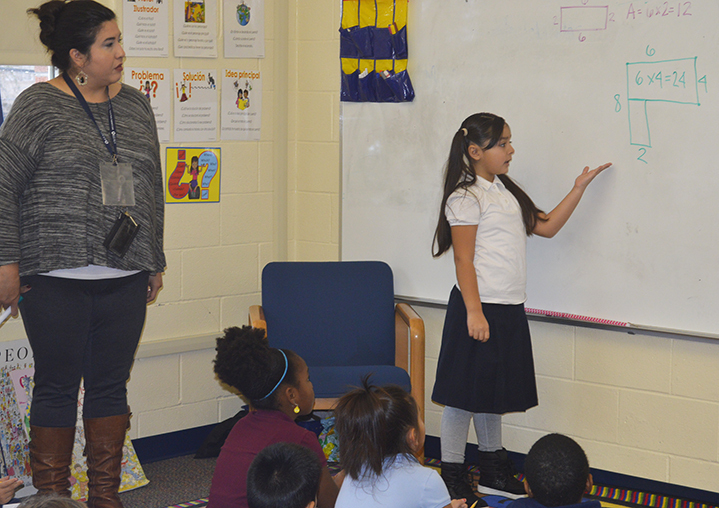 Students progress from 80-20 percent Spanish-to-English instruction in kindergarten, to 50-50 from fourth grade on. By the time they leave after eighth grade, those with at least six years of dual immersion are “bilingual and bi-literate,” and most test out of Spanish I in high school, she said. As someone born in Puerto Rico and raised in Grand Rapids, she appreciates the value of that education. She went to school at St. Joseph the Worker Catholic School -- whose empty church building stands near where the new school will be – because her parents felt comfortable its priest spoke Spanish. To have a neighborhood high school, plus lots of recreational and health services, will be a great thing for her students and Roosevelt Park’s youth, she said.